Static Memory Controller (SMC): SRAM, NOR, NAND support. 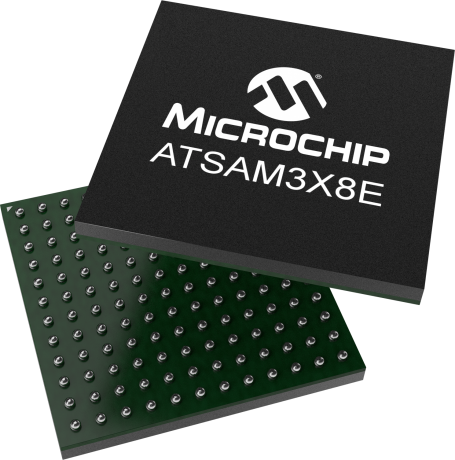 Based on the ARM® Cortex®-M3 processor, the Microchip's SAM3X8E runs at 84MHz and features 512KB of flash memory in 2 x 256KB banks and 100KB of SRAM in 64KB +32KB banks, with an additional 4KB as NFC (NAND Flash controller) SRAM. Its highly-integrated peripheral set for connectivity and communication includes Ethernet, dual CAN, High Speed USB MiniHost and device with on-chip PHY, high-speed SD/SDIO/MMC, and multiple USARTs, SPIs, TWIs (I2C), and one I2S. The SAM3X8E also features a 12-bit ADC/DAC, temperature sensor, 32-bit timers, PWM timer and RTC. The 16-bit external bus interface supports SRAM, PSRAM, NOR and NAND Flash with error code correction. The Microchip QTouch Library is available for the SAM3X8E for easy implementation of buttons, sliders and wheels. The device operates from 1.62V to 3.6V and is available in 144-pin QFP and BGA packages.